Scanspeak D2608/913000 Tweeter - Discovery Range - Peerless HDS 810921 replacement. Reliable performer, good value for money. 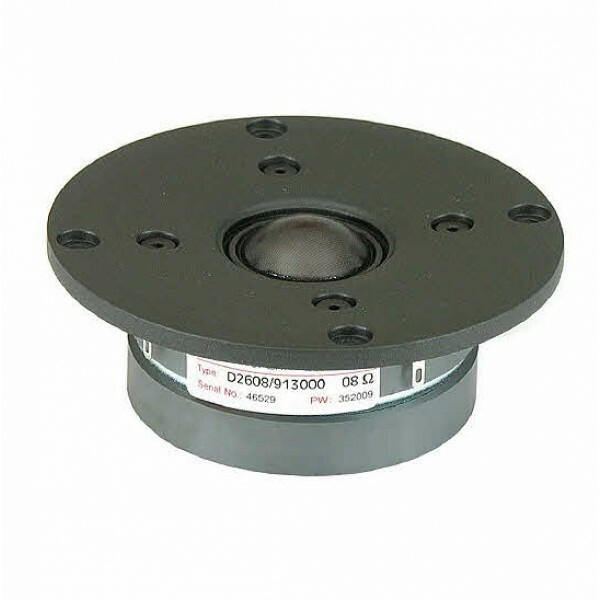 Scanspeak D2608/913000 ( Peerless 810921) Tweeter, a Discovery Range tweeter. This is the Scanspeak Danish made version of the Peerless HDS 810921 Tweeter. Featuring a very Low Mass Soft Dome Diaphragm and a Fully Vented Motor System for Low Compression, Ferrofluid Cooling, very low mass soft 26mm dome, and a good solid high quality black die-cast aluminium face plate. A quality tweeter, good value and reliable performance.